I love any reason to celebrate.....thank goodness for the person who invented holidays!!! With St. Patrick's Day coming up, I thought it would be fun to bake some fun shamrock cookies. Also, St. Patrick's Day is my dad's birthday...Happy Birthday Dad! It works out well that green is his favorite color! As I was decorating these cookies, I realized that my cookie cutter only has 3 leaves, not 4 leaves. 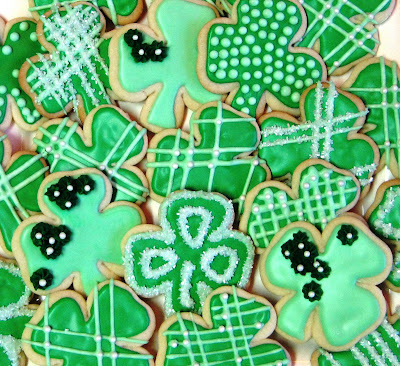 What a rip off, haha... we'll just pretend these are 4-leaf-clovers. I love using royal icing because it dries smooth and hard. I've found this to be the best method when decorating cookies, especially if you plan to package them as favors. They will hold up very well and won't smudge. However, if you going to add glittery details and pearls, make sure you add them quickly after icing, because once the icing dries its too late! 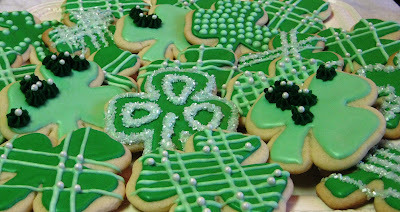 Here is a link to Wilton's Royal Icing recipe. I look forward to one day having a house full of kids and all of their little friends that come with it, so then all of these treats I love to make will be eaten up no problem! (not for another year or two or three, haha) For the time being, I love to give them to our hard working trash men that come every Tuesday morning, our mail man Billy that comes everyday around 1:00, and the nice guy Kurt at our bank that likes to talk golf, and last but certainly not least, our two local CVS Pharmacy ladies, Barbara and Natalie, who make our CVS the best in America! I love seeing the smiles on their faces! We can never say "thank you" enough! 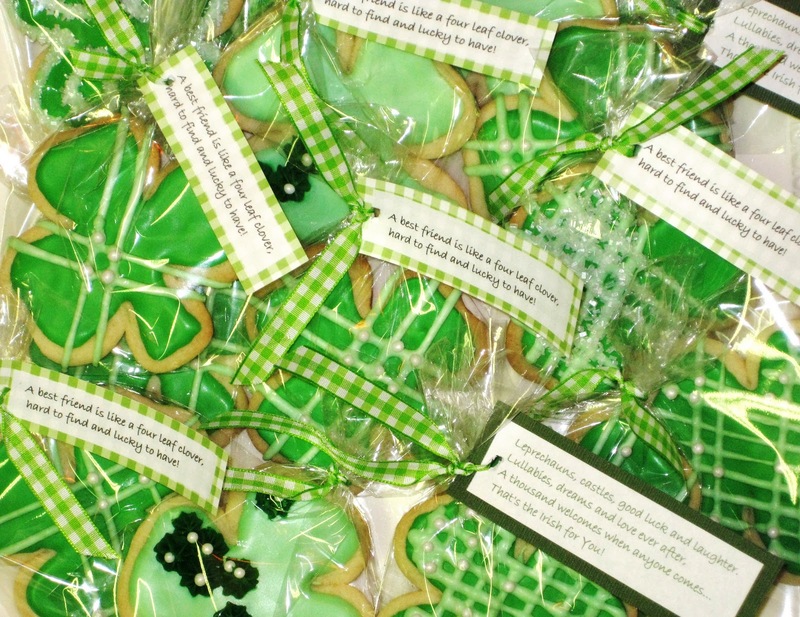 I added these cute little St. Patrick's Day quotes that I found. 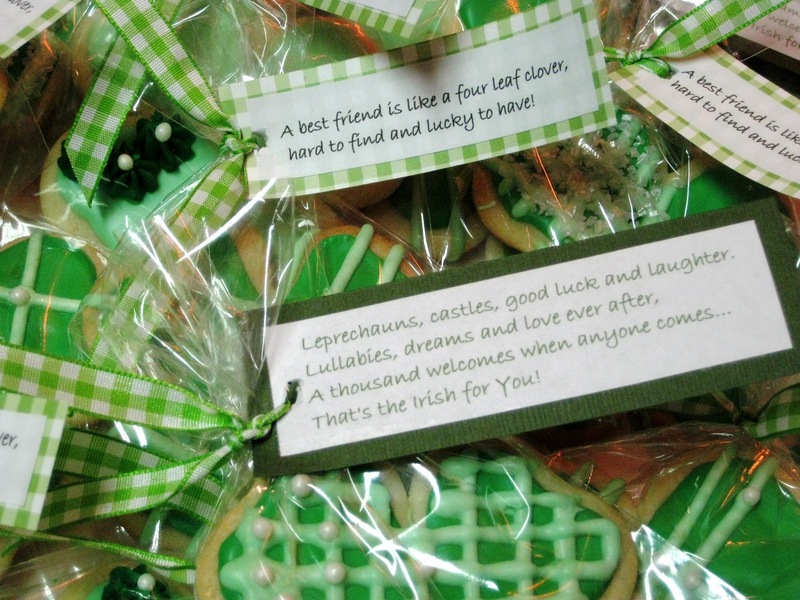 "Leprechauns, castles, good luck and laughter. "A best friend is like a four leaf clover, hard to find and lucky to have!" "May you die in bed at ninety-five years, shot by a jealous husband (or wife)"
Ummmm....I hope nobody toasts that to me! haha I thought I should use a quote just a little more uplifting...I'll save that one for April Fools Day! Um! ADORABLE! Why are you the sweetest thing in the world? !